TPM Customs is the work of Tim Meyer, one of the Pimp My Batmobile development partners. Tim has created some nice high-end re-detailed Hot Wheels Batmobiles for a few clients and has had a couple on eBay as well. 1. Chute details: Tim added metal tape, Jewelry wire and some gold metalic paint to accurize the chutes more like the #1 car. 3. Wheel Bat Spinners: This is one of the simplest yet most dramatic visual upgrades that can be done to the model. Getting the right season one spinners is as easy as removing the existing spinners and replacing them with photo etched metal spinners with vinyl, white-rimmed, color-matched emblems on top of the metal. Is there any chance I could puchase 3 sets of bat spinners (1/18 scale). You did a GREAT job. I’m sorry but we can’t separate the hubs from the sheets. BUT we can sell you 3 sheets cheaper, Give us an email. OR you could see if some other modelers don;t need the hubs and share sets. I don’t understand, seperating the hubs from the sheets? Please Send me info for the sheets. I’m interested in updating mine. 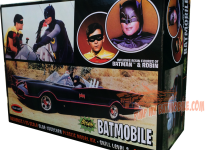 I would like to know if I can purchase a few sets of Batman & Robin figures for the 1:18 Batmobile. Thanks!